I have been staring at a few books that just don’t make sense for quite some time now. They aren’t Quantum Physics or anything, just mismatched craziness. The problem is I can’t throw them out. One is a Barbie chronicle that any girl who grew up with Barbies would cherish like their first born….maybe. One is a St. Louis landmark book, and one is a Ripley’s believe it or not book with a super fancy 3-d cover. None of them are very “pretty” per say but I love looking through their pages and learning. You caught a glimpse of them in this post. And I was so embarrassed of their mis-matchedness that I actually hid them in this post. Super fast, super easy project comin atcha… You want to know how easy this was? I walked downstairs and dug out some pretty scrapbook paper and the I just made simple bookcovers. Twenty minutes tops. Now I can just sit and stare at my pretty books. Which brings me to my next point…I am so happy that publishers have started making book covers almost art-like. All of the books I have bought recently are gorgeous enough on their own I will never have to wallpaper books again. I’m not hating on Barbie and Mr. Ripley, ok maybe I am. 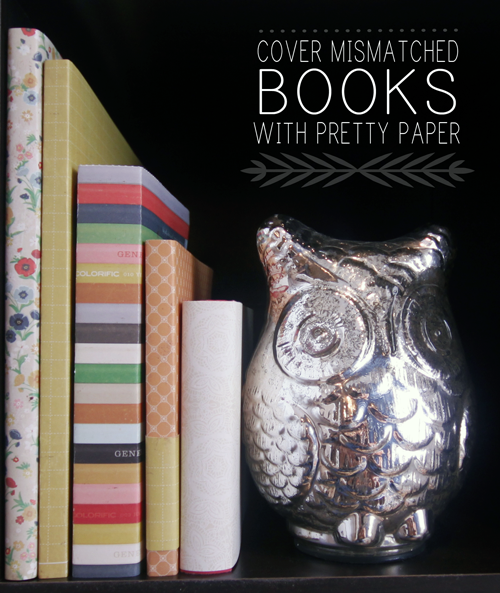 Have you bought any pretty books lately? Ever dressed up your library? I’d cover up my embarrassing ones (Barbie? Come on Christina! haha. Bet Tim’s pumped that one’s hidden) but not the ones I really love. If you re-covered these sooner, I would’ve never known that you studied advertising and that would be sad! I actually didn’t cover that one….you know, just the books I have had since I was sporting a retainer a pigtails got a makeover haha! I like this. 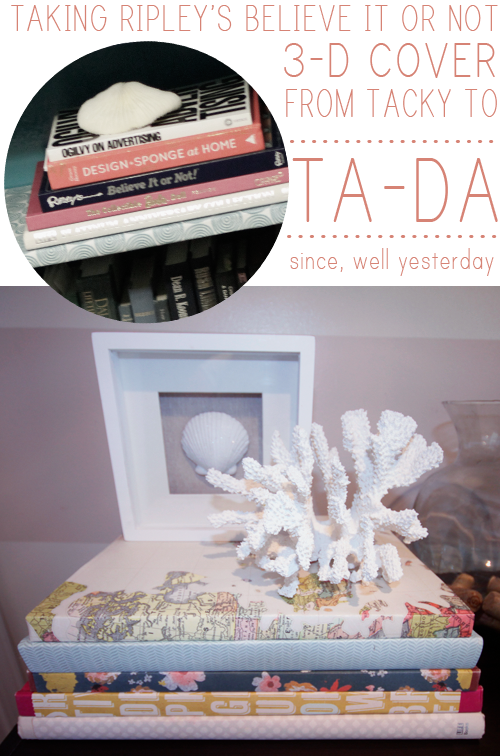 Its a simple idea, but one that works for turning a tacky old book over into a cute decorative piece. You’ve got my thumbs up. Thanks girl, I just got so sick of that 3-d cover….it was driving me insane haha! That is such a brilliant idea! I have a couple of those books that are nice enough not to throw out but too ugly to have in the bookshelf… Gonna be doing some covering! Seriously, it was soooo easy and sooo fast! You should definitely do it!! !